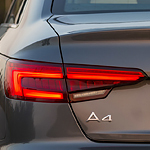 The first thing you'll notice about the A4 when you take a tour in Salt Lake City is its sophisticated shape. The body of the car features sculpted lines throughout. These lines help to redirect air and reduce drag on the road. Overall, it continues the traditional look that Audi is known for. However, the manufacturers have taken the style up a notch with very modern accents. On the front of the car, you'll find the large single-frame grille. The grille is quite tall and features sleek horizontal slats for a futuristic look. Available LED headlights are installed on both sides of the grille. The angular shape of the lights makes the car look like its always in motion while helping to improve visibility on the road.